From Custom Upholstery, To Custom Bedding… Evco Interiors Can Do It All. 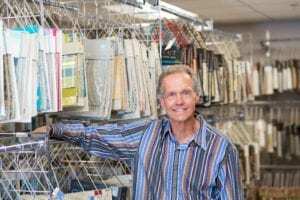 Evco Interiors owner Don Evans in his showroom. With Over 50 Years of Experience, An In-House Fabrication Shop, and An Unbelievable Design Team – No One Can Do What We Can Do. >Hello, my name is Don Evans and I am the owner of Evco Interiors. As the owner, I am super proud to say that no one can do what we can do. The reason we can offer an unparalleled amount of services is because we have such an amazing team. You can read more about them in our About Us Team Page. Because of this amazing team we can offer services in both residential, commercial and even industrial settings. Furthermore, we keep an incredible selection of custom fabrics and custom upholstery on hand to ensure that we meet your exact needs. So whether you need custom upholstery, custom bedding, drapery, pillows, floors or even custom furniture… make sure to call us. Let us show you why Five Star Resorts and Casinos trust us. And why you can trust us to. To get started, simply click on the link below to direct you to the service you would like to learn more about.